France risk premium has been taking off ahead fears that Marine Le Pen will be victorious. Carax-Alphavalue’s analysts make a reference to FT Alphaville article which in turn cites an intriguing piece from a Consob quant researcher (Marcello Minenna) about the gap between two classes of CDS on both French and Italian debt.”The technical differences between the two classes (ISDA 2003 and ISDA 2014) highlight the insurance premium to cover the risk associated with an exit from the euro and, in addition, the potential scope for depreciation in the event of a return to a national currency, explain. They leave the technicalities to the Alphaville piece but give the chart below that is telling a pretty neat story about the markets’ changing expectations about a Frexit : at the recent peak, this meant an extra spread of 25bp. 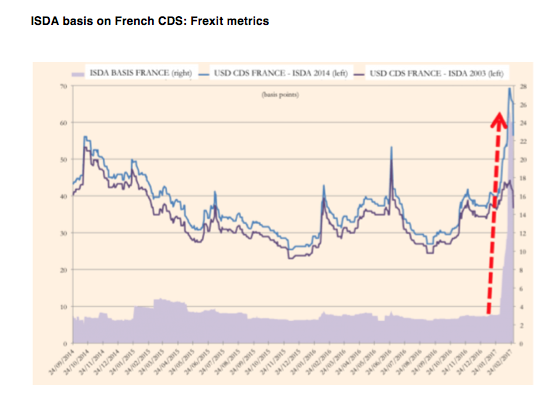 In equity terms, French banks would be at the centre of a Frexit vortex, having to fuel the economy while depositors would sell francs and buy euros. Obviously the loss in the lending margin would be a huge multiple of the above fear spread. 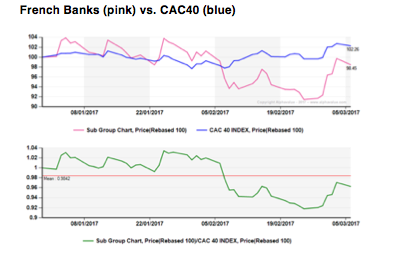 The following relative performance chart (green line) of the combined four large French banks shows indeed how the change of expectations translated into a precipitated drop of c. 10% vs. the banking sector at large (40 banks, about €1.2tn market cap). The recovery is only partial with about 5% still missing from the pre-crisis of confidence picture. Interestingly, the French equity index (CAC40) hardly budged over the same period when French banks were tanking. And the CAC 40 itself essentially performed like the Stoxx600. 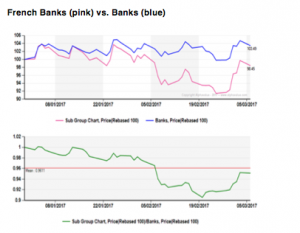 The message is presumably that markets have yet to take note of a political downside risk in France, unless one is a skin-sensitive investor in Banks. 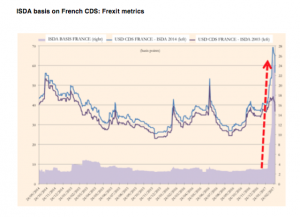 Dealing in CDS to net that Frexit risk is one thing. But it is a sure bet that most bond investors will short the index and think next, i.e. double up on shorting French banks. Their combined market cap is about €160bn but only BNP (Reduce, France) and SocGen (Reduce, France) post decent floats. In other words, the closer the elections (1st round 23/04; 2nd round: 07/05) the more rock’n roll those shares will be. Keep an eye to buy on the lows. 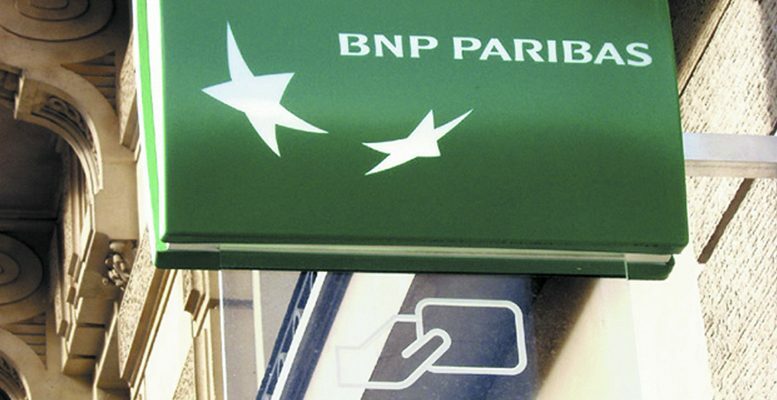 We currently have a 2% downside on BNP and a 7% one on SocGen without allowing for pre-election fits of nerves.